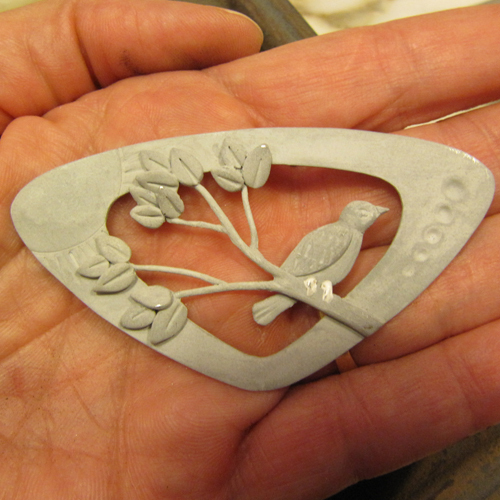 Today I did my final finish work on the Treetop brooch, so that it was ready for firing. 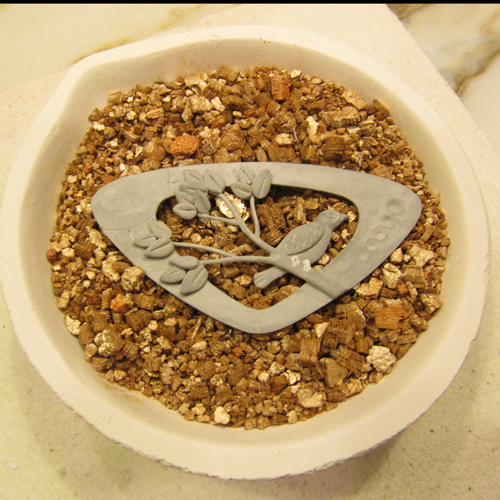 Because both the front and back are not flat, I supported the piece in a bowl of vermiculite for the open shelf firing. After 30 minutes at 1000°F, the piece looked relatively unchanged, but perhaps even darker gray in color. 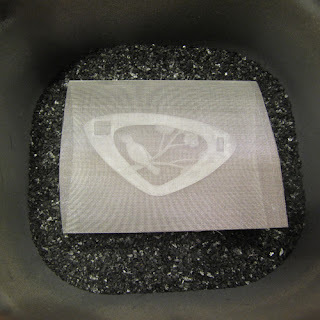 To prevent carbon inside the open areas from distorting the shape during substantial shrinkage, I placed the brooch face down on a crude envelope of fine stainless steel mesh. I just folded the mesh in half with a slight dome to the top. The packet was placed on half an inch of carbon in a stainless steel container, then covered with another half inch and a lid. I held the dome in place while covering half of the packet to try to avoid compacting down the envelope on top of the piece. My only concern now is whether the contact with the mesh at the bottom will provide enough drag to limit shrinkage. Perhaps I should have placed a sheet of fiber paper there as well or instead of the metal mesh. Even so, the kiln is firing to 1500°F for two hours. The package says 30 minutes is sufficient, but as with all sintering processes, longer times give denser material, although with diminishing returns. I'll let the piece cool overnight in the kiln and check it in the morning. Wish me luck! Thanks for the well wishes! Results are posted.